What's New: The News & Events Archive has been updated with entries for April! Welcome to the new Project STYLE Website! Through this website, we hope to provide information and education about HIV/AIDS, substance abuse, and the connection between the two. We also have a comprehensive listing of community and campus resources available in Miami-Dade County. 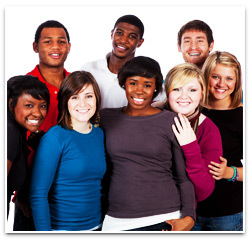 Project STYLE is here to serve young adults ages 18 to 24. Why? It's simple. We know from experience and research these are some of the highest risk taking years. Not only is a person's brain not fully developed until about 23-25 years old, but these are also the times when many young adults get to experience freedom for the first time. Young adults ages 18 to 24 are faced with a long list of "firsts", including experimentation with alcohol and/or other drugs and different sexual partners. While some individuals have the personality traits to make it through this period just fine, others may feel overwhelmed with all the decisions and responsibilities that define these years. Housed at The Village South, Project STYLE will offer useful information on alcohol and other drug use, free HIV testing, free risk-reduction counseling, and linkages to many other related community resources. These services will be available in college campuses and other locations throughout the county. Copyright © 2011 Project STYLE. Project STYLE is sponsored by The Village and WestCare Foundation.